The story of the Philadelphian cricket team has become fairly well known in recent years, and John Barton King has always been the focus of that story. He was without a doubt the greatest cricketer ever to hail from the USA. But one man does not make a team capable of beating Australia and many other professional sides. For all his brilliance King alone could not have made the Gentlemen of Philadelphia the force they once were. Who were the other men who made that side? Where did they come from? Where did they learn to play cricket? This is an attempt at their story; the other Gentlemen of Philadelphia. Many of the players who represented Philadelphia on their three famous tours of England had attended the Haverford College, an extremely exclusive institution in the affluent suburbs of the city where cricket was mostly played by people who were proud to call themselves Gentlemen. Philadelphia’s best batsman, John Lester, was an Englishman who had been invited to attend the college by its President, who had met him on a trip to England in 1892. Lester was an exceptional all-round athlete, a track runner who also played American football, tennis and what Americans call soccer. It was in cricket, however, that he found most fame. Although he had not been much of player in England, he developed his technique and dominated Haverford’s cricket scene, averaging 100 in his first year. He was a natural selection for the 1897 tour. Blessed with a strong defence and a good range of strokes, Lester was the leading batsman for the Philadelphians, scoring over eight hundred runs and averaging 37 over the fifteen matches, of which his side won but two. It was Lester who top-scored in both Philadelphian innings in their victory over Sussex, with 92 in the first (including a hundred partnership with King, who was already making an impact) and 34* to take them to victory in the second. He also made strong contributions to the other Philadelphian victory, over Warwickshire, with 35 in the first innings when several Philadelphian batsmen made starts but only Francis Bohlen made a fifty, and then 67 in a successful chase. During the tour he was impressive enough to be offered contracts by several of the counties, and he and King became the main attractions for English spectators- but as an Englishman he was less of a novelty than the American King. 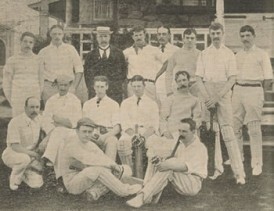 Continued success in Philadelphia led to Lester assuming the captaincy for both the 1903 and 1908 tours of England, and it was on the first of these that he became a complete player. Undoubtedly his finest performance came in the victory over Leicestershire, where, coming in at 2-1 in the first innings on a difficult pitch, he scored 126* out of just 200. He followed that up with a sixty in the second to help extend the Philadelphian lead beyond the reach of the professionals. He was greatly acclaimed both as a batsman and a leader- undisputedly the best batsman in the Philadelphian side and therefore the best batsman the USA ever had a hand in producing. Lester was less successful in 1908, but he ended his first-class career with an average of 33. His runs often gave King something to bowl at and he and King shared several profitable partnerships with the bat. Despite obviously not being in the class of Bart King, there is no doubt he was a fine player. He settled in America and became a key figure in US cricket for many years and in 1951 he edited a book celebrating a century of Philadelphian cricket. He is memorialised at Haverford College with a pavilion on their cricket field, still home to the only varsity cricket team in North America. Lester though was atypical- he was not American. His fellow Haverfordian George Patterson, captain on the 1897 tour, was born and raised in well-to-do Philadelphian society in 1868. At that time, cricket was the summer game of choice amongst members of his social class- hence why their preferred educational institution became the alma mater of many Philadelphian players. As well as representing Haverford, he played for Germantown CC, one of the four major clubs in the city, from the age of 15 and was once known as “America’s WG Grace”. This is hyperbolic- but his first-class averages of 40 with bat and 21 with ball suggest why the comparison was made. He batted “in good style” and was a useful medium-pace bowler. He toured England with the 1889 Philadelphia side- which did not play first-class matches- and topped their batting averages as well as taking 42 wickets. In 1894, playing for his own picked men against a similar side led by former Derbyshire batsman Arthur Wood; he scored 271, a record in US first-class cricket. His reputation meant he was the natural choice to captain the 1897 side. Although he was overshadowed by Lester, he finished second in the batting averages. He scored 162 against Nottinghamshire and shared a 196-run partnership with the same Arthur Wood who captained the opposition when Patterson made his double ton. Unfortunately, Notts managed to hold on for a draw after following on, and Patterson did not contribute much to the side’s two victories in the end. Upon the team’s return to America, he was quick to scotch suggestions the side’s poor results were due to umpiring bias. Older than most of the other Philadelphians, it was to be his only first-class tour of England but he was always remembered as one of their finest players; perhaps he would even make an all-time USA side. Another Haverford player who enjoyed a formidable reputation was the wicketkeeper Henry Scattergood. From a leading Quaker family, like many Americans including King himself he was originally a baseball player- a catcher. When he went to Haverford, however, he was converted into a wicketkeeper- the two positions involving similar skills- falling under the influence of the cricket culture there. While a very limited batsman at first-class level, he was an athletic stumper who kept very well to King- something that was probably quite a challenge given his reputation for disguised swing. Scattergood had been part of the Haverford touring side that went to England in 1896 and so was a good choice to go with the Philadelphian side in 1897, although he only played three games before returning home. He played most of his cricket for Philadelphia on the 1903 tour and received plaudits from Gilbert “the Croucher” Jessop, who said Scattergood was in his way as remarkable as King- an interesting comment. His career cut short by injury, he was known for his passion for cricket and John Lester wrote that Scattergood had done more than most to try to keep the sport alive in Philadelphia. Haverford produced many other Philadelphian players including Christopher Morris, a hard-hitting batsman who blasted 162 against Nottinghamshire on the 1903 tour who was also a cricket fanatic, founder of the library named after him at Haverford- an incongruous addition to an American university if you do not know much of its history. Not all Philadelphian cricketers came out of Haverford College, however. The man who partnered Bart King with the new ball in 1897 and 1903, Percy Clark learnt cricket at Germantown CC and developed to become a fine right-arm medium pace bowler. He took 199 first-class wickets with an average of 21. Against an Australian team in 1896, he took 5-46 to help Philadelphia to an innings victory. This performance, alongside good form in club cricket, earned him a place with the 1897 side. On this tour he took 32 wickets at an average of 31 each. In 1903, however, he proved a brilliant foil for King, taking over 80 wickets at just 20 each, including a superb 8-91 against Worcestershire, a match in which he also made his highest first-class score of 67, but despite his efforts Philadelphia still lost the game. Arthur Wood, an Englishman who had played first-class matches for Derbyshire before coming to America in 1879 aged eighteen, became a leading batsman for Philadelphia on all three of their tours. He came to the city to manage and play for Belmont CC, but was not allowed to play for the city team for 5 years because at the time the Philadelphian cricket scene had strict rules to preserve the American players- they did not want foreign professionals coming to America and pushing locals out. Wood instead represented the English Residents against the American Born players for four years and also turned out for the Rest of the USA against Philadelphia on several occasions. Once his qualification was up, however, he joined the Philadelphian side and scored 182 on his debut, against his old team mates of the USA, in an innings when George Patterson also made 132. He swiftly became one of the leading batsmen in the city team. In 1897 he came third in the batting averages with 702 runs at 27, including a 100 against Nottinghamshire. In 1903 he was less successful, averaging only 17 with one fifty. But in 1908 he finished top of the averages; playing eight games, he scored 385 runs at 25 including 132 versus Worcestershire. He deservedly held a reputation as one of the best batsmen in America. Another popular Philadelphian cricketer was the batsman Francis Bohlen, who also played for MCC, WG Grace’s London County and the famous Free Foresters. Whilst he never found his form when on the Philadelphia tours (his best tour being 1903 with an average of 27), in 1893 against the Australians stopping over on their way home, he scored 118, 33 and 54*. He was well-known in England because of his MCC matches and renowned for his drives. All these men live on in history in the shadow of John Barton King, undisputedly the finest player ever produced by his country; one of the finest bowlers of all time; a legend. Yet this focus upon him has led to the rest of his side being forgotten. The other Gentlemen of Philadelphia were not brilliant players as he was. The best of them- Patterson, Lester, Scattergood, Wood and Clark were competent cricketers who could have played professionally in England if they had the inclination to. They were the product on an extraordinary time; a time when a tiny population of affluent Philadelphians could somehow produce a cricket side capable of matching those of counties and even occasionally (and with the mitigations of long sea voyages) nations where cricket was far more widespread. And yet, even as they toured England, even as they beat Australia and Bart King was taking stacks of wickets, the sport was dying in America; it was the last glimpse of the potential the USA had to be a top-class cricket nation. The cause was already lost, and they were all of them, even King, doomed to obscurity in their homeland. Thanks for this piece. It was nice to read about the people who were forced, and rightly so, to play second fiddle to King. I have an original silver tint photograph of the Philadelphians, circa 1910, in the original frame. I am trying to identify the players, but have been unsuccessful so far since most online photos do not have captions, and online photos of individual players are often of poor quality. Can anyone help?